It was anything but a day at the beach for the No. 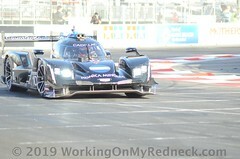 10 Konica Minolta Cadillac DPi-V.R duo of Jordan Taylor and Renger van der Zande during Saturday’s IMSA WeatherTech SportsCar Championship Bubba Burger Sports Car Grand Prix on the scenic Grand Prix of Long Beach (Calif.) street circuit. 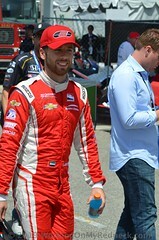 Never mind that Taylor was soldiering through the fast-paced weekend less than five days after undergoing an emergency appendectomy, or that he was called for a drive-through penalty for passing under yellow during a chaotic turn of events just two laps into today’s one-hour, 40-minute sprint race, sending the No. 10 Konica Minolta Cadillac DPi-V.R all the way back to ninth place but still on the lead lap with plenty of time left. 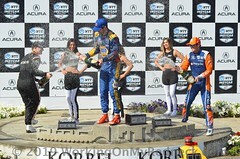 Shortly after Taylor handed the car off to van der Zande during the day’s first pit stop under caution on lap 23, 35 minutes into the race, the Dutch driving ace had the team’s sixth consecutive Long Beach podium finish plainly in his sights as he restarted in fifth place on lap 27. But less than four laps later, while following the lead pack through the back side of the iconic 1.97-mile, 11-turn temporary street circuit that once hosted the United States Formula One Grand Prix, van der Zande drifted into the concrete barrier while negotiating turn nine. The impact caused damage enough that the team had no choice but to retire from the race, sending the series co-points leaders entering the weekend home with a 10th-place result. In today’s opening laps, Taylor showed serious potential in his ability to pick off position after position after qualifying seventh Friday afternoon and picking up a spot when one of the Mazda DPi entries that qualified ahead of him was moved to the back of the pack. He immediately moved into the top-five on the opening lap. 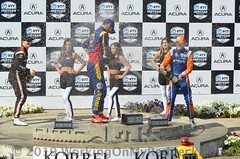 Then, while he and Juan Montoya ahead of him were both attempting to avoid an accident, Taylor had no choice but to dart to the left of Montoya and past him in order to avoid heavy contact with the Acura DPi driver. Nine laps later, after the race had gone back to green, IMSA officials declared that Taylor’s pass was made under caution and ordered him to serve a drive-through penalty, moving him from fourth to ninth place. He was able to pick up one spot before handing the car over to van der Zande. With today’s result, the team dropped from first to fourth in the standings but just three points behind the championship-leading No. 31 Action Express Racing Cadillac DPi-V.R team, which also encountered troubles today and finished sixth after a second-place result at the Rolex 24 and narrow victory over the No. 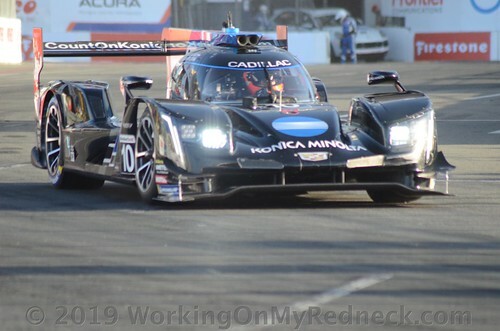 10 Konica Minolta Cadillac DPi-V.R team at last month’s Mobil 1 Twelve Hours of Sebring. Round four of the 2019 IMSA WeatherTech SportsCar Championship is the IMSA Sports Car Challenge at the Mid-Ohio Sports Car Course in Lexington on Sunday, May 5.